–Susan Blow, founder of the first kindergarten in the U.S. 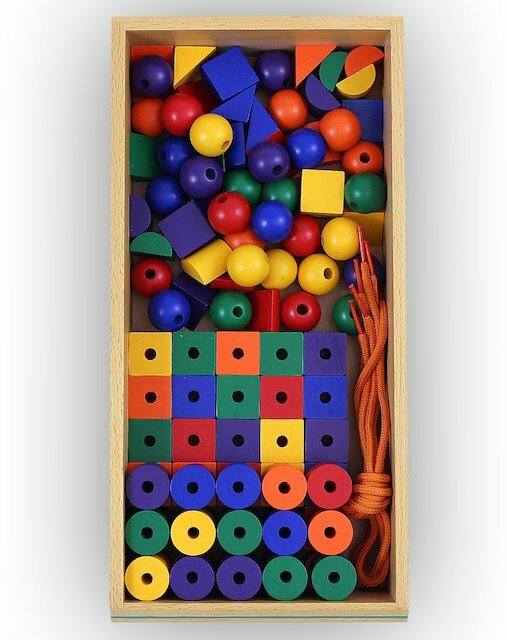 The Spielgaben 2 box contains used to contain two 2-inch cubes, two 2-inch spheres, and two 2-inch cylinders. New Spielgaben 2 now has 12 different basic to complex geometrical figures, allowing the child to explore the shapes & characteristics of each figure by studying and drawing planar figures. All new Spielgaben 2 contains 12 geometrical figures to help children to understand the core basics of mathematical figures & shapes. 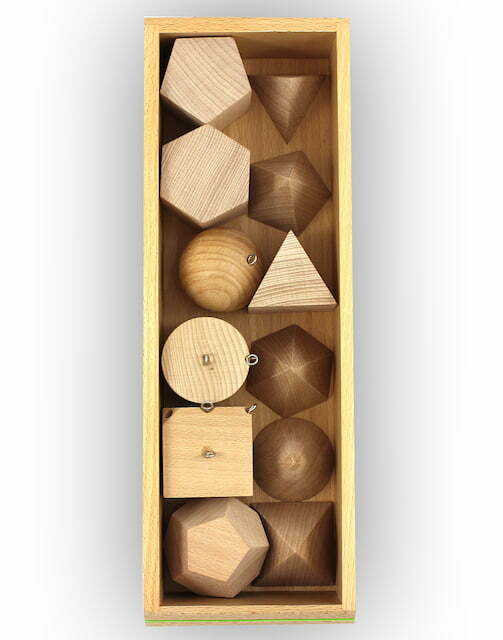 As kids move the shapes around in their hands or watch them move suspended in the air, they begin to understand unique geometric principles. Friedrich Froebel used these shapes to help teach children about the “interconnectedness” of form and material. When suspended, children can spin the shapes on different axes. By spinning a sphere, they could see some of the properties of a cube, by spinning the cube, they could begin to see the properties of a sphere, etc. The idea started with Plato who used similar toys to teach children about geometry and architecture. Frank Lloyd Wright, a famous American architect, referenced the maple blocks like those in Spielgaben 2, when discussing what influenced his design. In their general play, children will naturally come up with ways to explore the shapes in the set. They will experiment with different ways to stack and move the shapes, teaching them about each shape’s stability and determining the role it may play in building. They will also begin to experiment with suspending the shape in different ways, perhaps placing them on a stick instead of a string or moving the shapes around once suspended to see the many different ways in which the shapes can move and the forms they take in a child’s eyes. Spielgaben 2B is a modified version of 2. It contains five different types of solids: the cube, cylinder, sphere and diagonally cut 3D figures. Most of the solids in Spielgaben 2B have holes drilled into the middle of them. They also come in the six colors your child has experienced in Spielgaben 1. The addition of colors and holes enhances the range of possibilities that Spielgaben 2 provides. Your child can put strings through the solids and skew them with sticks. These activities can only be performed when you use this add-on. Children will learn to identify similarities and differences among solids and categorise each item by shape or color. Spielgaben 2B gives your child even more possibilities for building. A cylinder can be rotated like a wheel. A cylinder with a hole in it allows you to introduce the concept of the axle.